Where are you right now, and who have you visited in this location? Right now we are camping for the weekend near Maybole in South Ayreshire - and spent last week visiting companies in Inverclyde and Dumbartonshire such as Jet Cut It in Hillington, Bute Fabrics on the Isle of Bute and MYB Textiles in Newmilns. We also took a trip over to the Isle of Arran and visited a few individual makers - such as Richard Leclerc who trades in architectural stained glass and restoration. Do you have a resident artist/designer with you at the moment, and if so can you tell us a little about them and what they do? We have just had visual artist in residence Hrafnhildur Halldorsdottir with us for the week. She is based in Glasgow, and has been practising there for 15 years. It was fantastic having her in the van with us, as her interpretation on making processes and materials is completely different and it's opened up some interesting conversations about the fabrication of fine art work and material-led practice. Often she will work with found materials as a starting point too, which she was able to pick up some of this week! See more of her work on her website or you can find her DJ'ing at The Hot Club. 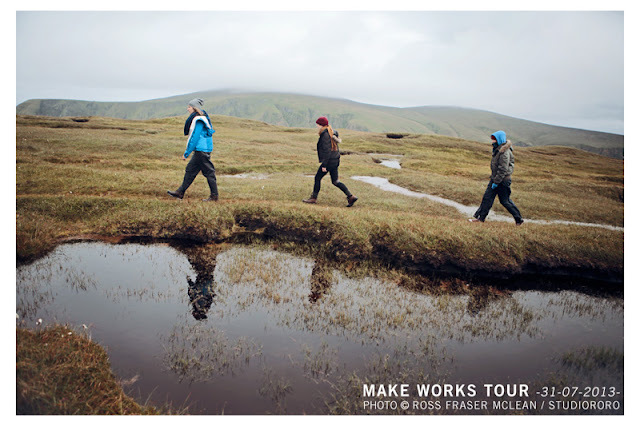 The Make Works tour is all about learning and discovery: what's been the biggest surprise so far? It really has been a huge learning curve! So far I've been most surprised by just how many places are out there - and that we are really just scratching the surface. A good problem to have really. Its been a pleasant surprise that larger industrial factories are, though sometimes sceptical at first, relatively open to new ideas and working with creatives too. We've been amazed with the skill of those working in industrial trades and their passion for what they do. I think that artists and designers should utilise that we have so much of these skills available locally in producing high quality work. On the other hand, it's been a huge reality check in realising the impact of the tourist industry on making processes and how this can directly effect the type of work produced, particularly in rural areas and when it comes to any notion of "craft" or traditional skills. We would love to challenge designers to push these ideas further and see the potential in these areas. Where has been your favourite location so far? Shetland. It's just a fascinating place. Before the tour kicked off, you called out for people to host you, feed you or simply join you for a pint or a chat: who have you met and how have you been received? Pretty well I think. The first month we stayed on lots of people's sofas and spare rooms (some amazing dinners, thanks to all that hosted us!) - then on the islands we were camping a bit more. We even got to stay in a teepee on Skye! We've met some amazing people along the way by just inviting people to meet for drinks or dinner though - it makes it much easier to get a hold on how different places work and what it is like to live and work there. How is Rhubarb holding up?! Rhubarb has never been better! (well, a couple breakdowns but nothing major) More than 2000 miles travelled... a few more to go. 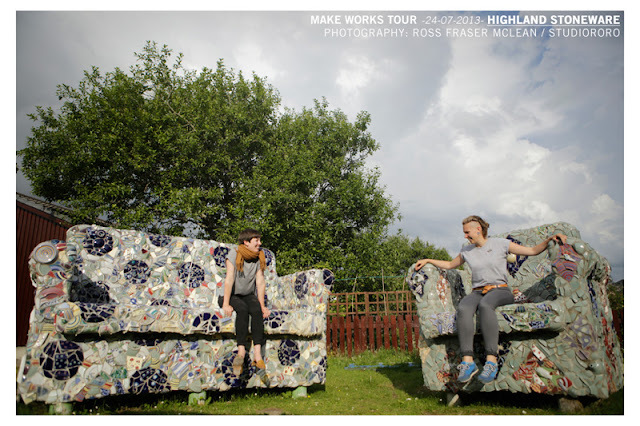 We are about to go for the last two weeks of the tour - which takes us through Dumfries and Galloway, then on to the Borders (lots of textiles and larger factories to come!) I can't believe that its almost all over! I think all three of us will be sad to get back to living stationary. We'll be continuing filming however over the autumn/winter months (as we kept finding more people while on our travels) We'll also be speaking at the Craft Scotland Conference the first weekend of October if anyone wants to hear more about our adventures. 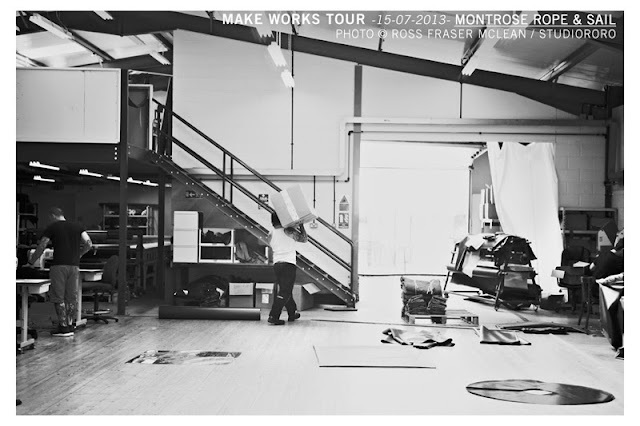 The Make Works Tour continues until the end of the month. 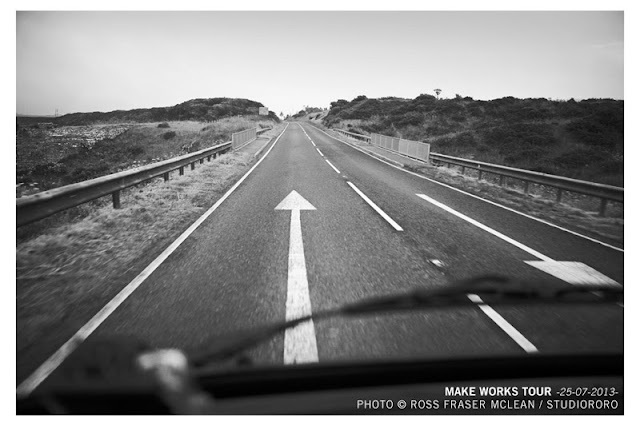 Keep an eye on their blog and timeline for more updates and images, and make sure to check out makeworks.co.uk in the future for the full directory of Scottish manufacturing!